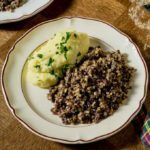 Religious holidays and other celebrations are often associated with traditional recipes. Christmas is no exception to this rule. We decided to dedicate this 50th week on 196 flavors to traditional recipes of the upcoming commemoration of the birth of Jesus. 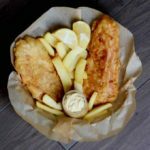 It is obviously easier to find typical Christmas recipes in Europe or South America, as these continents are home to predominantly Christian countries. When we think of Christmas, and especially Santa Claus, snow and Nordic countries immediately come to mind. It is believed that Santa’s main residence is in Lapland, the region extending north of the Scandinavian peninsula. Even if Santa is a fairly recent invention, there have been representations of a gift bearer character like Saint Nicolas for a long time. In Scandinavia, and particularly in Denmark, a character called tomte (or nisse) began to emerge in the mid-nineteenth century. A tomte was represented as a small white bearded-man in gray clothes and a red hat. It is Denmark that I decided to travel to this holiday season. I started to occasionally film recipes a few weeks. 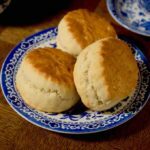 What I am particularly interested in is shooting these recipes with friends that are originally from the countries that we travel to. My friend Bettina whom I have known for almost six years, got married a little over a year ago. Her husband Jonathan quickly became my friend. He has a very interesting background. He lived in Denmark and Germany before moving to the United States and is fluent in these three languages. His father was Persian and his mother is Danish. Since the beginning of our adventure, I had in mind to put Jonathan to work. When I asked him to come cook with me, he immediately thought of his mother Lone, a native of Copenhagen who loves cooking as much as I do. 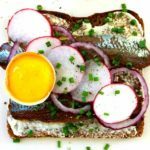 A native to help me prepare a Danish dessert? It did not fall on deaf ears! A traditional Christmas dinner in Denmark is generally composed of roast duck, sugar-browned potatoes (brunede kartofler) as well as risalamande. 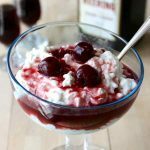 Risalamande (also written ris a la mande) is a rich rice pudding with almonds topped with sour cherries in their syrup. Yes, you guessed it, the name comes from the French riz a l’amande (rice with almonds). Risalamande is a dessert that appeared in the late nineteenth century in Denmark. 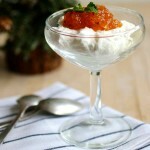 It was customary to prepare a large quantity of rice pudding for the night before Christmas Eve (lillejuleaften). On the eve of the 23rd, people had some of the rice pudding, garnished with butter, sugar and cinnamon. 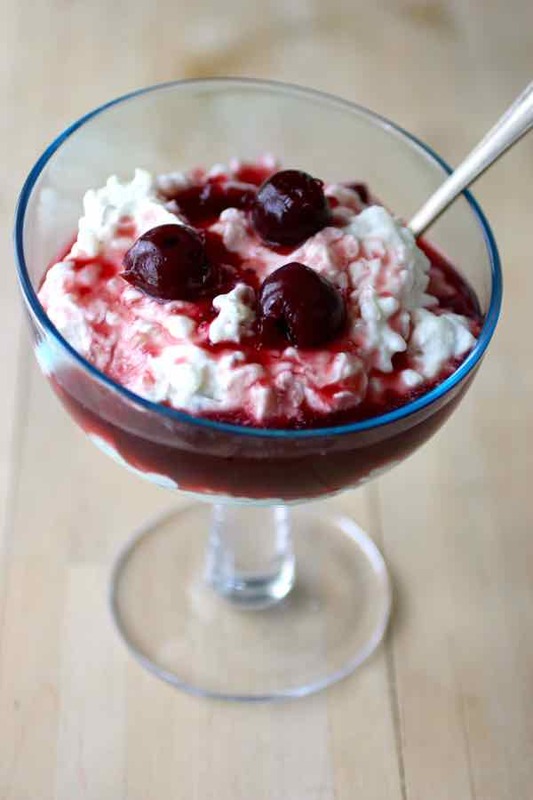 On Christmas Eve, the rice pudding leftovers were prepared with whipped cream, almond, syrup and cherries. It is this preparation which gave its name to risalamande. There are a few variations of this dessert in the other Scandinavian countries. 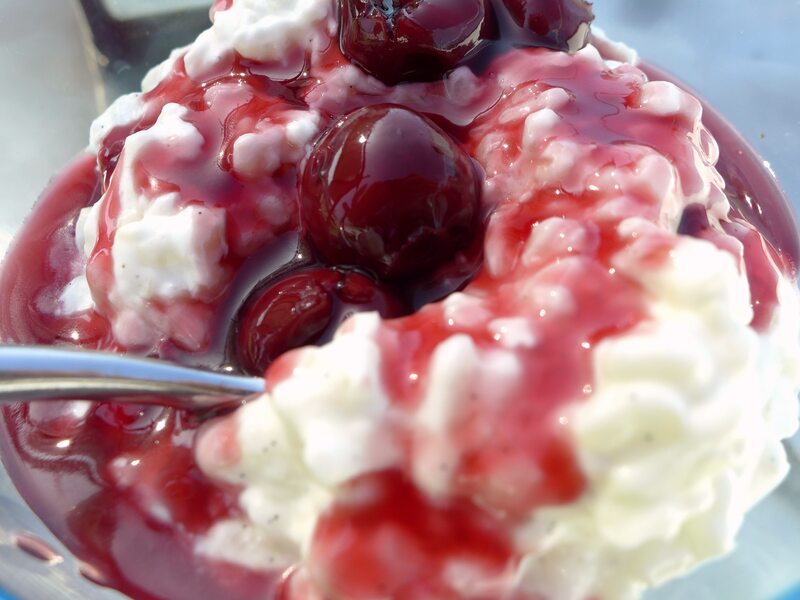 In Norway, for example, rice pudding is called riskrem and it is usually topped with raspberry sauce. In Sweden, it is called ris a la Malta (a corruption of ris a la mande) and does not contain almonds. In Denmark, it is customary to place a whole almond in the risalamande. The person who finds it wins a prize. This prize is usually a small marzipan pig, or a chocolate heart or even a toy if the winner is a child. Lone even confirmed that whoever finds the almond is supposed to keep it in the corner of his mouth till everyone finishes his risalamande so that everyone thinks they have a chance to win… and everyone actually finishes his risalamande! It is Jonathan who won that Sunday morning… too bad I didn’t have a prize for him! This tradition is reminiscent of the French custom associated with the Galette des Rois in which a porcelain figurine designates the (Wise) King. 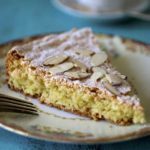 This frangipane-based pie is also a Christian tradition that is not celebrated at Christmas but at the Epiphany, a full week after New Year. Lone, Jonathan and I had a great time tasting this delicious and rich dessert on my sunny rooftop… and enjoying a shot of Heering (or two, I do not remember too well). I did not know this Danish liqueur, but believe me, this sweet and sour liqueur deserves to be known. Let’s just say my alcohol supplier will soon hear from me. 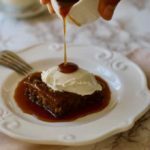 Cherry Heering liqueur is used in the preparation of the cherry syrup that Lone prepared for this risalamande. If you are unable to find Heering, there are other liqueurs that can be used as substitute like Massenez , Guignolet or Kirsch. Lone’s dessert could not have been more traditional. The only atypical aspect of this risalamande was probably tasting it under the autumn sun of Los Angeles. I will think of snowmaking guns for our next tasting! I must confess that I am generally not a fan of rice pudding… I often eat this dessert at Indian restaurants where they call it kheer. I have to say that I was initially skeptical about this risalamande but I must admit I was wrong: this Scandinavian dessert was excellent. 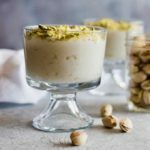 To start with, the crushed almonds give this rice pudding a very unusual crunchy texture. In fact, my wife Anne who did not know the composition of the dessert thought the rice was not cooked enough! 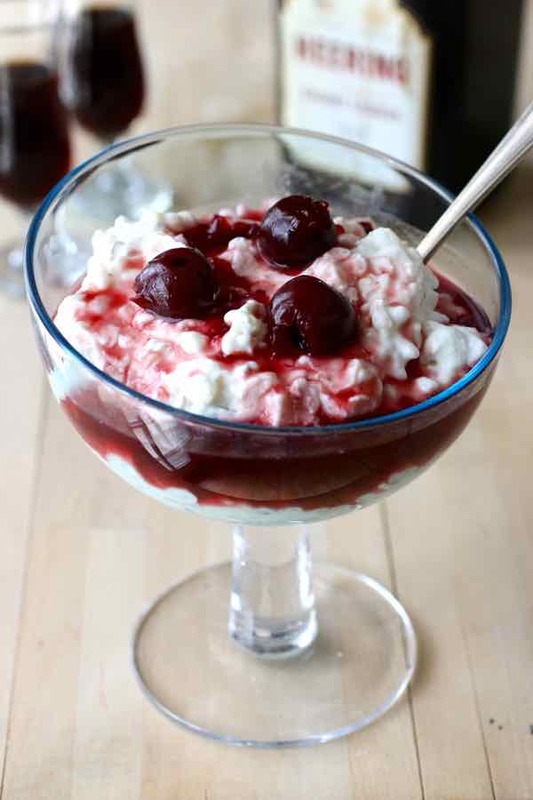 Then, this cherry syrup and liqueur give a sweet and sour flavor often lacking in other rice pudding recipes that are typically too bland to my taste. 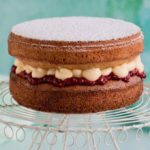 The whipped cream adds a rich and airy consistency… as well as a few hundred calories. An absolute success, and probably one of the best desserts of 196 flavors so far. 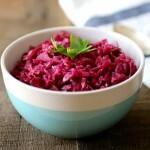 Easy to prepare and just delicious… especially with a shot of Heering (or more) to top it off! Combine milk, 6 tablespoons of sugar and rice in a saucepan and bring to a boil. Reduce heat to medium and simmer until the rice is tender and mixture is thick, stirring often, for about 30-40 minutes. Pour the rice pudding into a bowl and let cool completely. Add the chopped almonds and the whole almond. Using an electric mixer, beat the heavy cream and 2 tablespoons of sugar in a medium bowl until stiff. Scrape the vanilla bean to extract the seeds. Add vanilla and cream in rice pudding mixture. Cover and refrigerate for about 4 hours. Drain the cherries and collect the syrup in a saucepan. 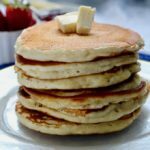 Add 2 tablespoons of sugar (or more depending on syrup) into the pan. Add the cornstarch mixture and bring to a boil, stirring constantly. Add the reserved cherries and cherry Heering liqueur and continue to simmer, stirring occasionally, about 5 minutes. Pour the rice pudding into bowls. Top with warm cherry sauce. 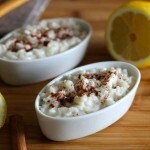 I love rice pudding but have never attempted to make it. This is a lovely presentation that just makes me want to try and make it for my family! This is my kind of dessert creamy with a little tartness. Lovely recipe. G’day Sign me up to try! Looks yum! So pretty and festive for the holidays! That looks luscious and delicious!! This looks so good! 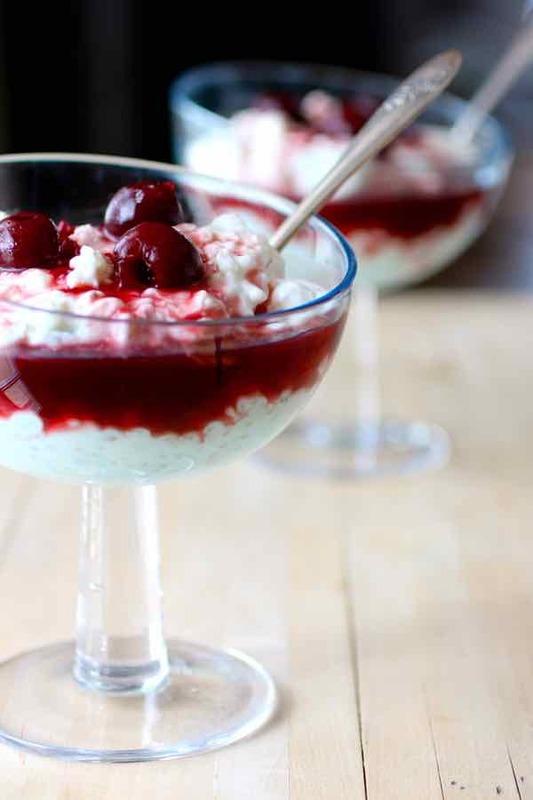 I love cherries, and I love that you served it over rice pudding. Yum! Oh, that sure does look delicious!